In need of a gift, but don't know what to give? 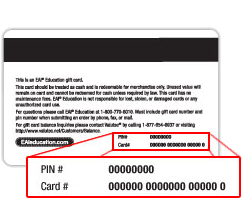 Give the gift of learning with an EAI Education Gift Card, perfect for teachers and educators. There are 2 easy options for presenting your gift. Select ‘Gift Card’ to mail the card (with free standard shipping) or choose ‘E-Gift Card’ to instantly email it! To purchase a gift card in another amount, please call customer service at 800-770-8010.